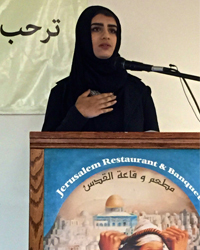 “Every minority in America is treated like a problem long before they are treated like a person,” began a member of the Arab American Action Network’s (AAAN’s) Youth Organizing Program at a community event last week. 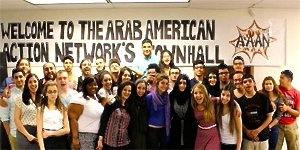 During the summer of 2012, a small group of youth at the AAAN was determined to begin a community-based campaign to put an end to racial, national, and religious profiling by law enforcement, which saw a sharp increase subsequent to the events of 9/11. The youth of the campaign have conducted surveys, data analysis, and extensive research, and have built alliances across racial lines with other organizations, communities, and youth to further their ultimate goal of equality and justice for all. On Thursday, August 13th, AAAN youth publicly and officially launched the campaign at a community town hall meeting that attracted 175 people. 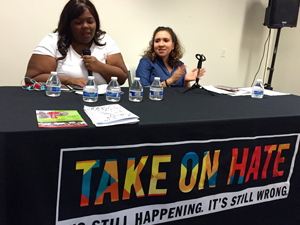 The town hall began with an introduction calling community members to action, making clear that without action, being educated on the issue alone is no longer sufficient. The call to action was followed by spoken word poetry presentations, emphasizing the increase in police violence fueled by systemic racism and racial profiling. The same theme was represented throughout a ‘zine, entitled Liberty and Justice for All? which was distributed to every guest. This ‘zine, along with a corresponding video also created by AAAN youth, described common misconceptions about law enforcement’s roles, responsibilities, and duties, and presented data culled from the community survey. Later, members of the Youth Organizing Program discussed the mission of the campaign, and described specific tools and tactics law enforcement uses in racial profiling. The presenters introduced the attendees to Suspicious Activity Reports (SARs) and the use of informants to spy and entrap members of the community, and further described the possible courses of action community members can take to combat such tactics. The end of the presentation was another call to action for community members to get involved and join the AAAN in fighting the policies of racial, national, and religious profiling. The next steps in the campaign include publication of a report with the complete survey results; demanding an end to the usage of SARs and the use of entrapment and informants within our communities; and hosting of accountability sessions with law enforcement agencies on these issues. Some FOIA requests have been submitted, but there have not been any responses yet. 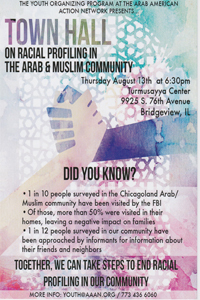 The youth then transitioned to present some of the results of a survey they wrote and conducted, which reached over 450 members of Chicago’s Arab and Muslim communities. The questions asked participants about their experiences with various law enforcement agencies, as well as their feelings toward agencies like local police departments, the FBI, Department of Homeland Security, Transportation Security Administration, and Immigration and Customs Enforcement. The analysis of the statistics were displayed through interaction with members of the audience, who were asked to stand up according to the corresponding sticker color on their chair once each fact from the survey was read. This provided a visual representation of the statistics that were being shared. The audience was surprised to learn some of these statistics, such as that one in every twelve community members surveyed by the AAAN had been approached by an informant. 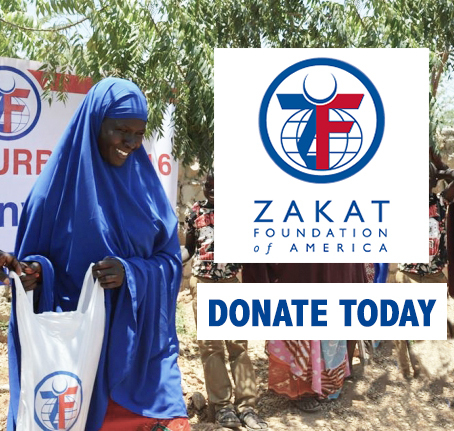 These facts, as the youth stated, added additional significance and legitimacy to their campaign, and have paved the way for the future publication of a professional survey report to be used for community education. The town hall ended with a panel discussion including Veronica Morris Moore from Fearless Leading by the Youth (FLY), Idalia Cervantes from the Illinois Coalition for Immigrant and Refugee Rights (ICIRR), and the testimony of a member of the AAAN’s Arab Women’s Committee whose son experienced profiling and harassment, read by Rasmea Odeh. The panelists identified the issue of racial profiling and structural racism as it affects the Black, Latino, and Arab communities across Chicagoland and the U.S. The panelists not only embodied the solidarity and coming together of different groups with similar missions, but they also underscored the cross-community struggles against discrimination by law enforcement. Examples of such struggles include the escalating violence, abuse, and neglect inside the Cook County Juvenile Detention Center; the lack of a level-one adult trauma center on the Southside of Chicago; and the challenges faced by immigrants and refugees in asserting their rights to full and equal participation in the civic, cultural, social, and political life of society. Manar Daghash is a member of the AAAN Youth Organizing Program. Islam is not an ethnicity!! !